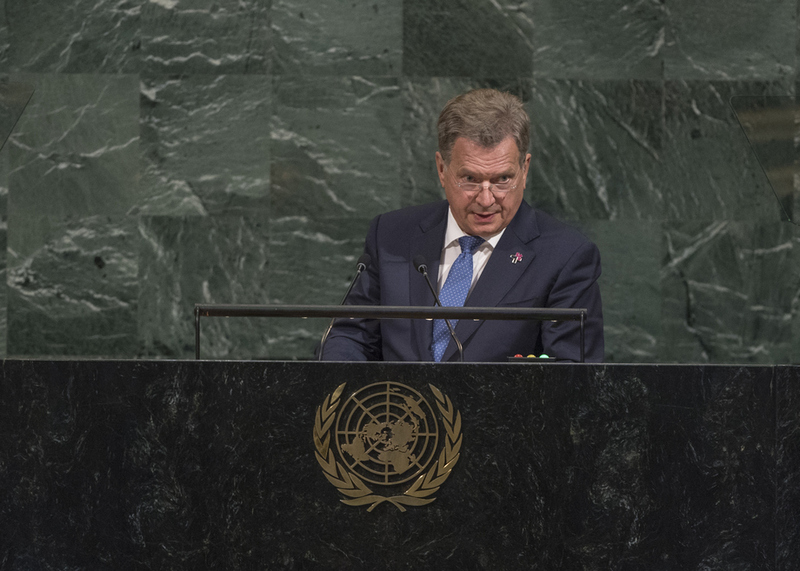 SAULI NIINISTÖ, President of Finland, welcomed the Secretary-General’s efforts to reform the United Nations into a more transparent, accountable and efficient Organization, as well as his focus on conflict prevention and peacekeeping. “Successful conflict prevention saves lives and financial resources,” he said, advocating the use of mediation to prevent conflict and human suffering. It was important to include women and children in peace processes. “Women, children and adolescents often pay the highest price in conflicts, but they can also help to pave a way out of the crisis,” he said. To that end, Finland had helped to establish a Nordic network of women mediators aimed at sustaining peace through the inclusive and meaningful participation of women in all phases of peace processes. While conflict prevention was important for maintaining peace, efforts to strengthen peacekeeping must also continue, he said. Finland had increased its participation in United Nations police missions, including a specialized team on sexual and gender-based violence deployed to the United Nations Mission in South Sudan (UNMISS). In such work, the United Nations must ensure that none of its staff were associated with misconduct in any form. “There must be zero tolerance with regards to sexual exploitation and abuse,” he stressed. With conflicts raging, the number of refugees had mounted over the years, he said, with 157,000 lives lost globally in 2016 due to conflict, and refugees numbering almost 68 million today. Citing conflicts in the Middle East, Africa and eastern Ukraine as examples of untold human suffering, he said the international community had failed to maintain peace and security. The nuclear weapons programme in the Democratic People’s Republic of Korea was a threat to global peace and must be stopped. The Security Council’s cooperation on that issue had been successful, he said, and it was important that unity prevailed, as continued provocations by the Democratic People’s Republic of Korea could not be tolerated. He expressed support for sanctions and called on others to do the same. A solution could only be sought through negotiations with the Democratic People’s Republic of Korea, he said, calling the Treaty on the Non-Proliferation of Nuclear Weapons the foundation for nuclear disarmament. In a similar context, it was important that all parties honour the nuclear deal on Iran and he likewise welcomed recent talks on strategic stability between the United States and the Russian Federation. He went on to highlight terrorism and violent extremism, the spread of disease, population growth and rapid urbanization as other trends threatening global security, noting that, if mismanaged, urbanization could increase rootlessness, hopelessness and even radicalization. On climate change, the world was not acting fast enough. The Artic in particular deserved heightened attention, as it was warming twice as fast as the rest of the world. “If we lose the Artic, we will lose the whole world,” he warned.